Manera is a company started by Raphael Salles, owner of F-One. Raphael’s team is known to log extensive R&D hours, so it makes sense that the F-One crew would parlay all that water time into a harness and other soft goods. 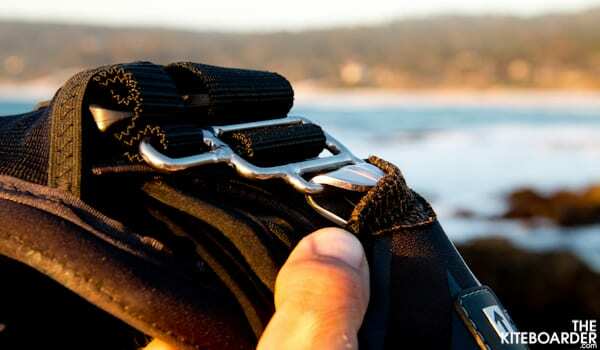 After extensive analysis of the kitesurfer’s needs, Manera created harness that clearly defines a new level. Developed in close collaboration with a human kinetics laboratory, the EXO harness optimizes load distribution and significantly enhances riding comfort. With innovative features like Energy Dispersion Frame, Cocoon concept, Ergonomic Prefit and Downhold System, Manera is truly establishing new standards in the history of kitesurfing. "The Exo Harness is the centerpiece of Manera’s offerings and represents three years of research and development in an attempt to add more than just a new logo to the harness market. 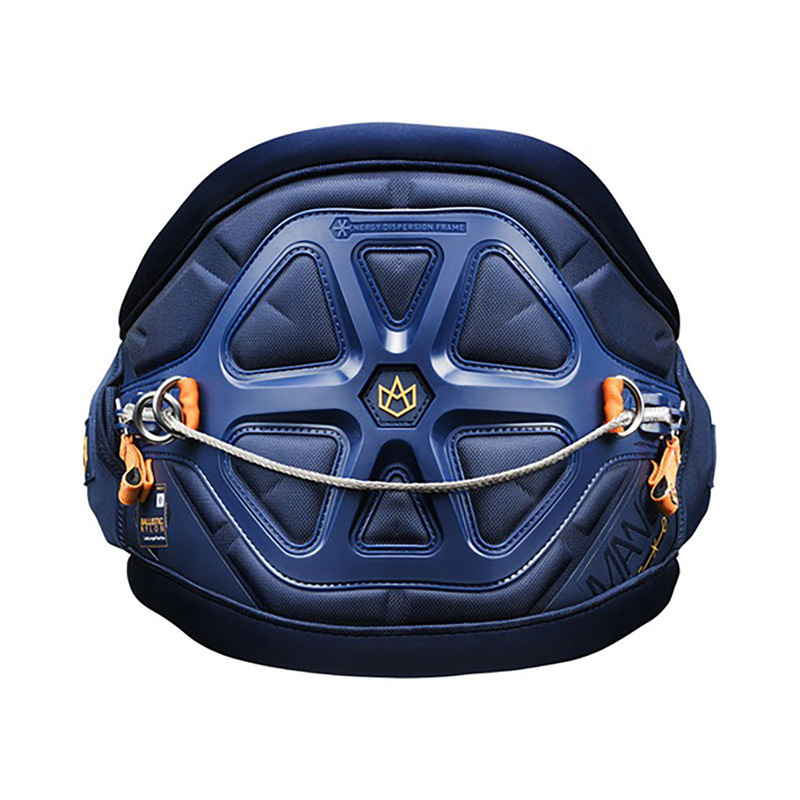 Manera’s biggest innovation in the Exo harness is a molded frame positioned on the outside of the harness. This frame pushes against five different layers of multi-density foam and neoprene to deliver a thin but comfortable fit with the torso. The rigid back plate extends around the hips to the spreader bar, which seems to keep the load on the frame of the harness instead of the soft materials, effectively reducing the pressure on the rider’s hips. The Exo has rigid flaps on either side of the spreader bar that tuck into the harness body to help create a solid feel and keep the spreader bar in place. In addition, the webbing attachments for the spreader bar are tall and asymmetrical to give the harness more leverage over the spreader bar and prevent upward slip. The Exo can be ordered with six different spreader bar lengths, the idea being the proper harness / spreader bar combo will have very little webbing between the two. The Exo also features a tall frame version in the medium, large and X-large sizes in order to incorporate height as well as waist size into choosing the correct harness. After both wetsuit and non-wetsuit sessions our testers reported that the Manera EXO delivers excellent back support yet feels thin and flexible enough to get every grab. The spreader bar pad was comfortable and testers reported the harness stayed locked in place below the ribs. Testers reported the preformed C shape made for a good fit along tester’s sides and the foam back pad matched the ergonomics of their backs. Testers noted the spreader bar doesn’t have a quick release, which requires users to adjust the webbing straps to get in and out of the harness. Although this requires more effort, the upside of this design is the absence of working parts that risk being fowled by sand and the potential for an unexpected release. Overall, the Manera Exo features a clean and well thought out design that places load where you want it – on your back. The spreader bar feels locked in place and doesn’t roll up into your ribs. Testers gave the Exo high praise for providing comfort and support while leaving extensive range of movement for fun and aggressive riding." www.iksurfmag.com // Rou Chater // EXO "The EXO harness from Manera burst onto the scene and radically changed the way harnesses were made, utilising an exoskeleton to put the frame of the harness on the outside and all the padding on the inside. Manera also worked with a human kinetics science laboratory to test their products to ensure they could make the most comfortable harness possible. The first incarnation was an instant hit, and despite the cost, they won fans around the world. I found it to be the most comfortable harness on the market for my body shape; it is worth mentioning that harnesses are very personal things(...) In fact, I liked it so much when I took a different harness with me on a long trip and found it not to my tastes, I paid some hard earned cash to get an EXO shipped out to my location! Moulding you can see on the back integrates with the webbing, buckles and the spreader bar to create an external shell around your body. Sizing is important as Manera recommend having a minimal amount of webbing between the buckle and the spreader bar. There are six sizes in the range from XS to XXL and each spreader bar is sized to suit each harness. The EXO from Manera is one of the most comfortable harnesses I have ever worn. I’ve been a fan of this harness since it was first launched and the next model only deepens the love affair. The beauty with the EXO is that the Energy Dispersion Frame works so well there are no pressure points or places you can feel the harness “pinching” at all. When it is sized properly and it fits perfectly, I don’t think there is a more comfortable harness on the market for me. We love this harness against the skin in hot countries when you are wearing board shorts. The Neoprene Seamless Area does a great job of minimising any chaffing of the skin. The Tuck Flaps and Down Hold System keep the hook in place, even in the heaviest of wipeouts. The new EVA bar pad is comfortable too, after wearing this for a few months I’ve not noticed any issues or areas where it has proved to be anything other than silk against your skin. Obviously, there is some noise in the marketplace about sliding spreader bars at the moment. The EXO has a fixed hook but is designed to twist a little in the waves around your body, because the Energy Dispersion Frame is flexible this doesn’t cause any issues. In fact, when the harness does move on your body it flexes and remains comfortable at all times. I rate this as one of the most comfortable harnesses on the market; it’s not given me any reasons to not love it. I’ve got the 1st, and 2nd generations in the garage both looking exceedingly well used and I expect new one is going to get a similar amount of treatment over the next years." 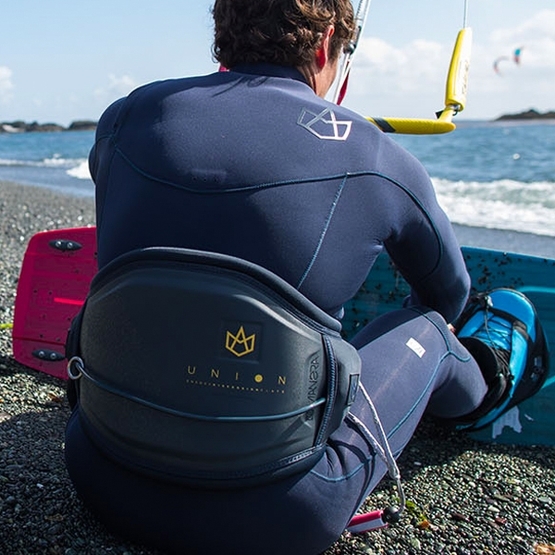 www.iksurfmag.com // Rou Chater // UNION "While most of the harness brands are making super high-end products with the new rigid harnesses, Manera have bucked the trend somewhat. The excellent EXO arguably led the charge for a more supportive harness many years ago, and it does a fantastic job. New for 2018 Manera have launched the Union, priced lower than the EXO it aims to make incredible comfort at an affordable price. The look of the harness is very stylish, and the one-piece back plate looks bang up to date in terms of styling, but unlike its carbon cousins out there it is actually soft. The idea is that instead of the EXO’s external frame a single Energy Dispersion Plate is housed inside the foam of the harness. This results in much cleaner look than the EXO but still offers excellent support. The other clever aspect of the Union is it is designed to be exceedingly lightweight, even when wet. A minimum amount of material is used, and the idea is that most of the materials won’t absorb water. This is a very very light harness, and even better if you sneak in a last minute session before a flight home, it won’t tip the scales at the airport either having soaked up half the ocean. Manera make some of the most comfortable harnesses on the market, the test team are often on the water for 8 hours per day. You are going to be crippled if your harness isn’t the best it can be. The Union feels fantastic on your body; it’s almost as if you aren’t wearing a harness at all. No points of pressure and it is so light you hardly notice you have it on. Packed with the usual high level of tech from Manera it’s great to see the spreader bar with the Down Hold System straps, which stops any riding up. The spreader bar features plastic coated ends to increase the longevity of the webbing straps which is a great upgrade. The Tuck Flaps combine with the Down Hold System straps to give an impressive low down hold, if you fit this harness with the correct sized spreader bar (Manera have different sizes to ensure an exact overall fit) then you get zero rising up, it’s impressive! An incredibly light and exceedingly comfortable harness from Manera, at a time when prices for top end harnesses seem to be skyrocketing it’s great to see the Union hit the market. It’s top-level comfort with high-end hold down for a great price, try one on, and you won’t be disappointed! EXO vs. MANERA comparison by The Kiteboarder Mag: "Last year, Manera released the Union, a new harness with the same load dispersion technology and comfort but at a much lighter weight. From the front, both harnesses look similar and both feature Manera’s spreader bar system: appropriately sized spreader bars for each harness size (XS/S/M/L/XL/XXL) to reduce warping and lateral contraction along the sides of the harness. Both the Union and the Exo feature Manera’s Down Hold System and Tuck Flap technology. 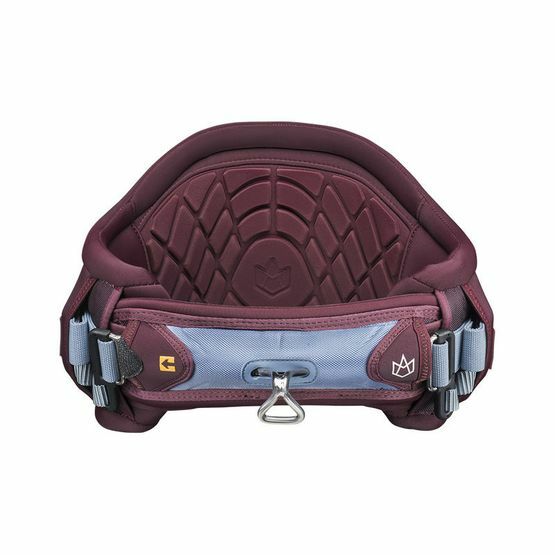 The Down Hold System features an asymmetrical buckle that distributes the pull from the kite downwards in order to avoid the hook from pulling upwards and pulling your harness up into your torso along with it. The Tuck Flaps are extra stiff flaps inserted into the harness that assist the Down Hold System by keeping the spreader bar and buckle connection in place and preventing the harness from riding up. The Union looses the visual appearance of the Energy Dispersion Frame on its exterior but instead has an Energy Dispersion Plate inside. This plate works the same but instead of placing the technology on the exterior, the plate is placed on the interior of the harness, eliminating excess foam and unnecessary stitching, and providing a more durable and long-lasting harness. Finally, the biggest difference in the Union and the Exo harnesses is its foam construction. The Union uses a single injection mold for a single-piece foam backing which reduces unnecessary stitching and glue compared to the Exo which uses two Thermo foam layers along with two Nest foam layers. Consequently, the Union’s new construction makes the harness incredibly light — a size medium Union with no spreader bar weighs in at 2.4lbs! Due to the lack of multiple foam layups, the Union doesn’t absorb water and stays feather light during your entire session. Every windsurfing boards manufacturer has an array of various models designed for different disciplines, windsurfing styles and levels. In this blog entry we pick some recommendations for the gear for intermediate windsurfers available in our shop. 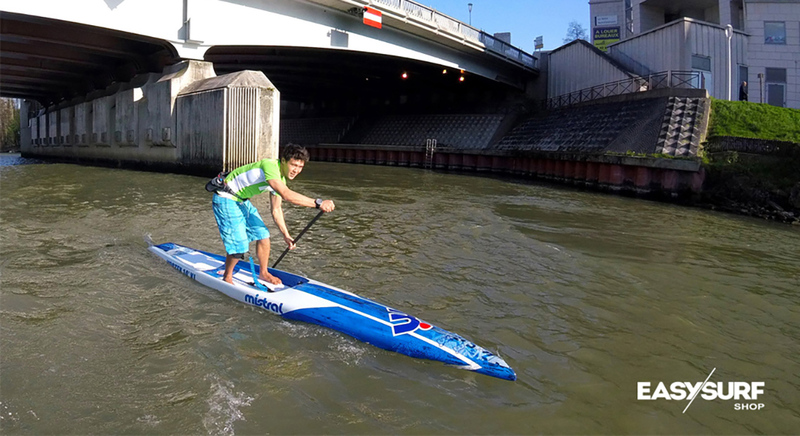 Inflatable SUP boards have one principal advantage over hard boards - it is ease of transportation and storage. That’s why their popularity exploded all around the world lately. One of the basic characteristics of the surfers that is the most impressive is the ability to maintain balance. This is due to many hours devoted to appropriate training using the right tools - such as trickboard. Read about 2019 windsurfing boards collection novelties from Tabou. Each board is a result of intensive research and development of shaper and pro team. North Sails and NKB (North Kiteboarding) has changed it's name for DUOTONE. Well known and respected products are now available globally under a new name. It’s a great board not only for flat water but for wind/surf conditions too. Every SUPerr, except for a board, needs a paddle and some accessories - like pump and a bag to carry the set or leash. 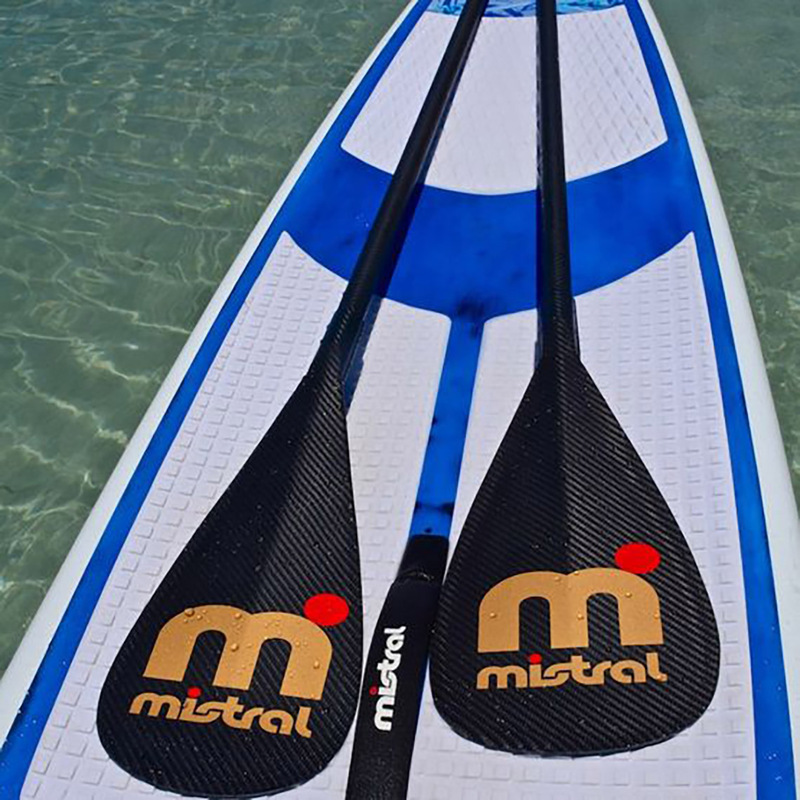 Read about Mistral products.